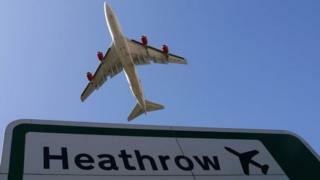 Senior ministers will gather in Downing Street this morning to approve what amounts to outline planning permission for a third runway at Heathrow Airport.The economic sub-committee, chaired by Theresa May, is expected to sign off the expansion plan, and then send it for approval by the full cabinet.If backed, MPs would then be asked to vote on the issue in the coming weeks. The government has backed expansion in principle despite opposition from key figures such as Boris Johnson.If the plan is backed by the cabinet, Transport Secretary Chris Grayling could come forward with the statement later this week, possibly immediately, the BBC's Political Editor Laura Kuenssberg said. It has to be voted upon no later than 21 sitting days after its publication. Ministers have accepted the recommendations of a 2015 review into airport capacity in the south-east of England.This concluded that building a third runway at Heathrow offered the greatest economic benefits - as long as it was accompanied by a package of measures to address its environmental and community impacts.A draft national airports statement was approved by ministers in October setting out the conditions for its approval.Parliament must approve the revised statement, which has since been subject to a public consultation, to allow the planning process to move onto detailed work.Foreign Secretary Mr Johnson, who is MP for Uxbridge and Hillingdon in west London, has long been opposed to Heathrow expansion on both economic and environmental grounds and has vowed to "lie down in front of bulldozers" to prevent it.Other critics include former education secretary Justine Greening, who also represents a London constituency, and shadow chancellor John McDonnell. Analysis by Laura KuenssbergYes, the decades-long debate about airports in Britain is returning (it's never gone for long) just at a time when the government is embroiled in rows it will struggle to win. As one cabinet minister joked, "it's the gift that keeps on giving".However, with only Boris Johnson having big doubts around the cabinet table, the real rumpus will be in the Parliamentary Tory Party.Plenty of Tory MPs have long held objections to Heathrow and they will be made loudly on the backbenches in the weeks to come. The government doesn't have a majority and remember, it wants to get this plan through the Commons by the end of the month.If they can, it will be a demonstration of "look, we are getting on with things, it's not just Brexit! "There will be howls, and the process even after this likely vote is a very long one. But the government can expect to get the vote through. Even if Labour opposes it, which it may well do on environmental grounds, the party is also split on the merits of the project so might not all vote together.Read the rest of the blogLabour has said expanded capacity is vital to the UK economy but its support is conditional on tests being met on capacity, climate change, noise and air quality as well as the wider economic benefits.